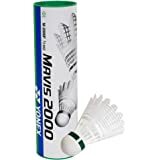 Yonex is the trusted name in the field of sports accessories having the most advanced equipment for sports like badminton, tennis, and golf, and their mavis series of badminton shuttlecocks is an example of the brand’s constant endeavour to perfect their gear. 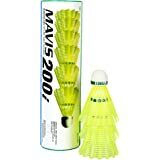 The mavis 350 nylon shuttlecocks can be easily compared to the traditional feather unit. 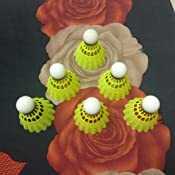 Designed to have the same flight time as a feather shuttle, these nylon shuttlecocks provide an accurate performance that is ideal for beginners and intermediate players. 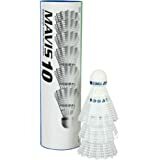 The mavis 350 shuttlecocks do not just have a flight time similar to that of a traditional feather shuttle, but they are also able to provide a more traditional feel compared to other nylon shuttles. 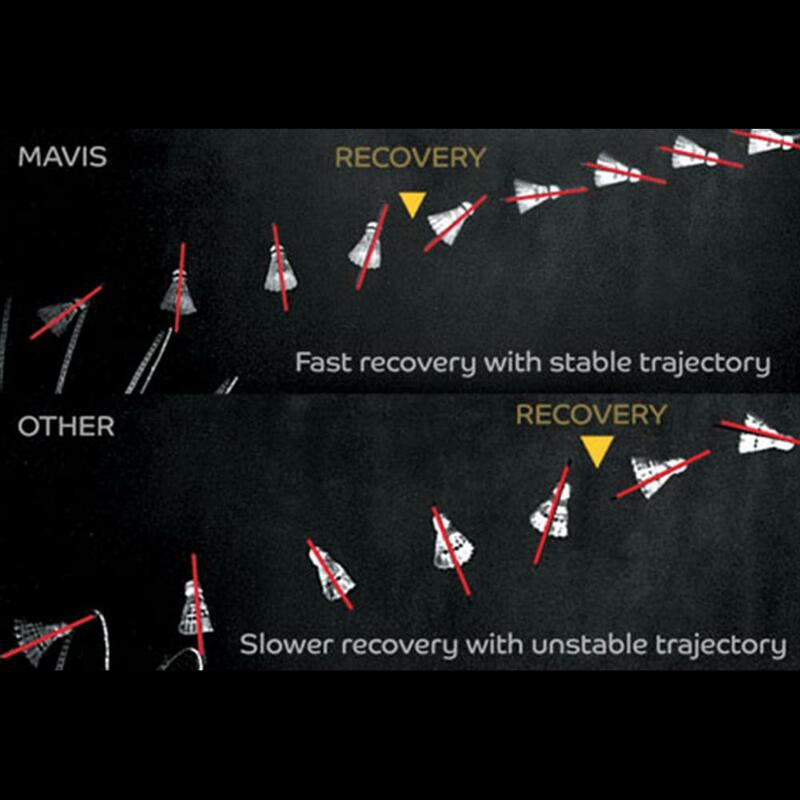 Their precision design enables a stable trajectory mid-air, which is further aided by a quicker recovery time. 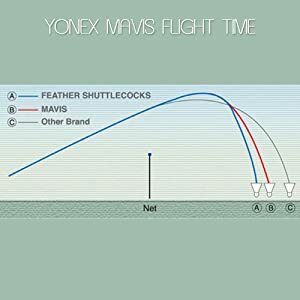 While conventional nylon shuttlecocks often falter in recovery, those from yonex’s mavis series differ greatly in performance. 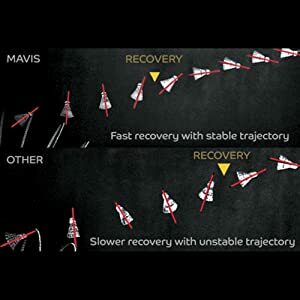 With a recovery time of only few seconds, the mavis 350 shuttlecock, when smashed with great force, comes quite close to the performance of yonex feather shuttles. 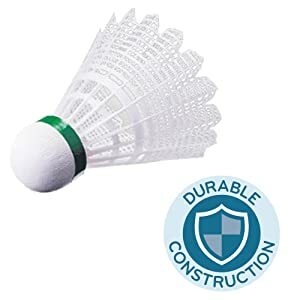 While badminton pros usually prefer using feather shuttlecocks, nylon shuttlecocks present a good option for beginners and intermediate level players. 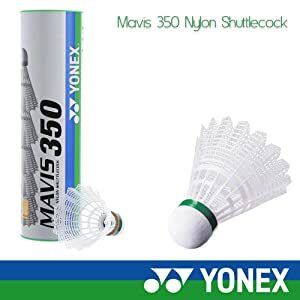 Their durability makes them perfect for using in practice sessions, while yonex’s engineering makes the mavis 350 shuttles behave much like a feather unit in their flight. With the mavis shuttlecocks, yonex has closed the bridge between feather and nylon shuttlecocks to a large extent. 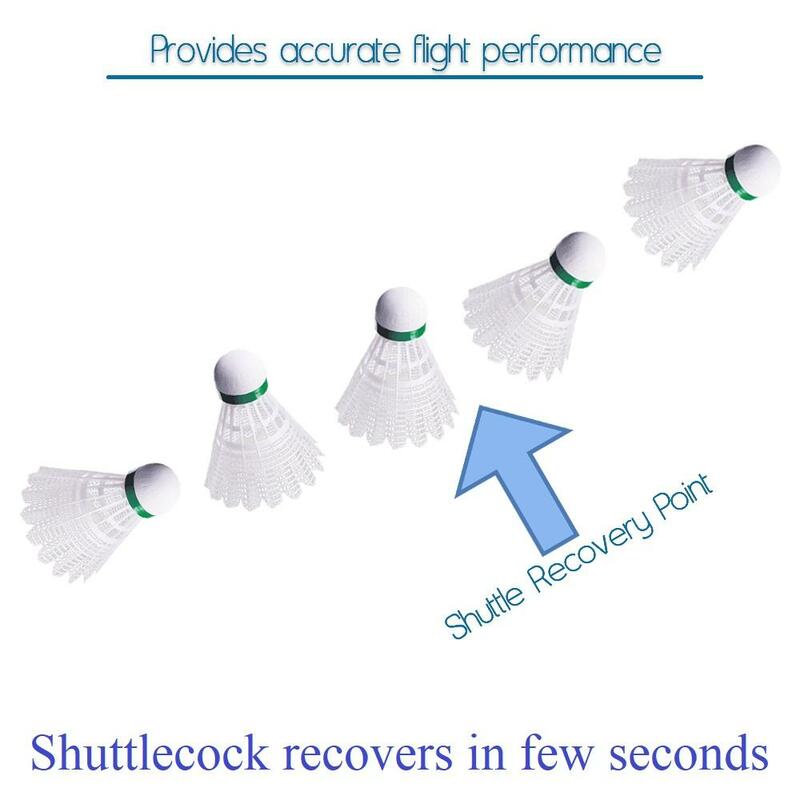 These have been engineered with precision to provide a performance that is close to feather shuttlecocks, the result being the same flight time as a feather shuttle. 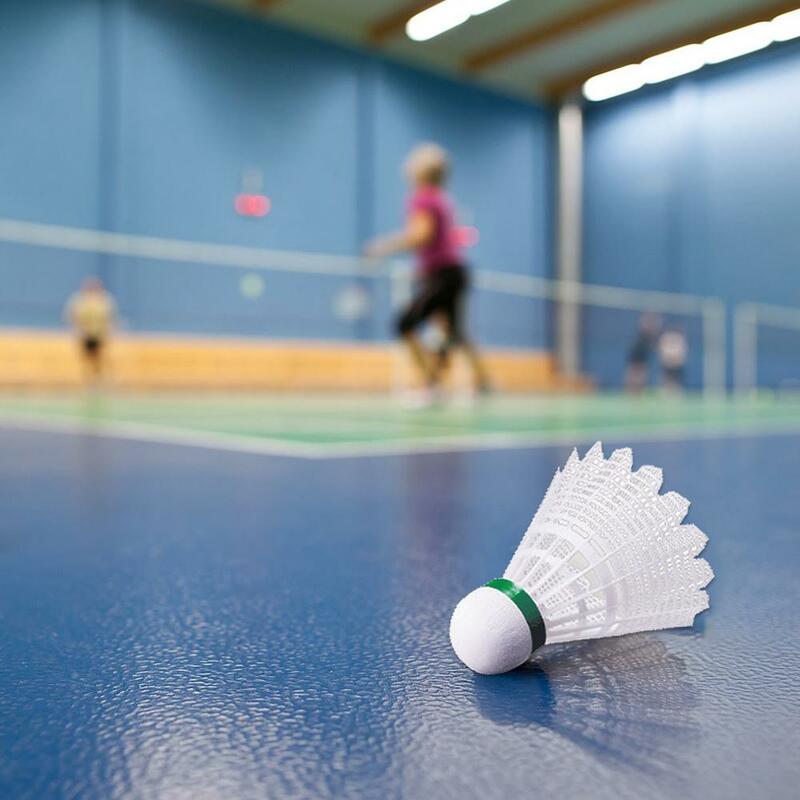 Yonex understands the need for identifying the right shuttle for a particular playing environment. 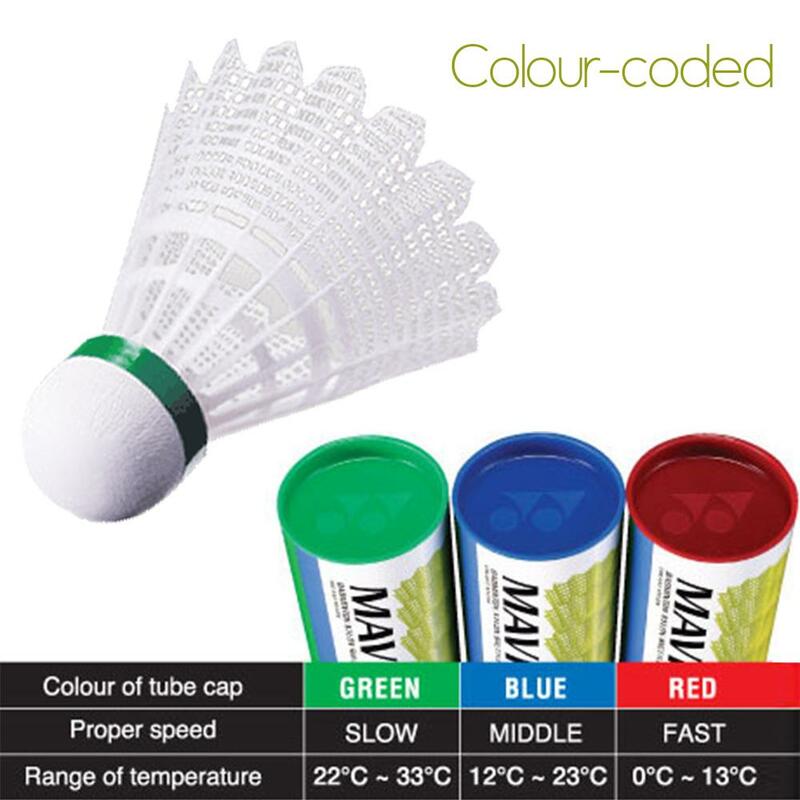 Yonex categorises their shuttles into 3 temperatures, each colour coded for added convenience. Red caps, blue caps, and yellow caps are suitable for 0-13, 12-23, and 22-33 degrees celsius respectively. 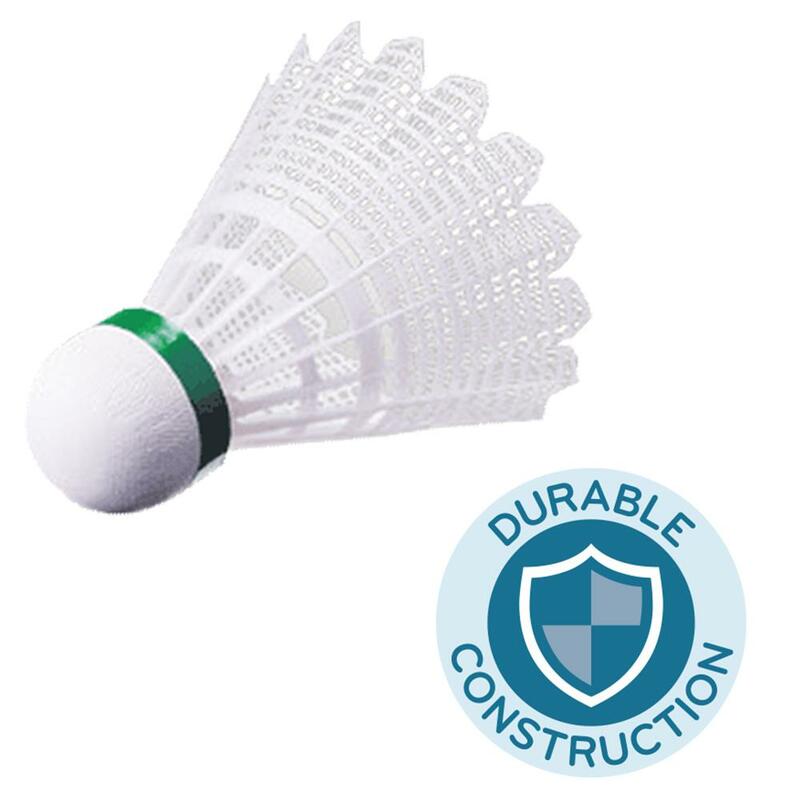 Nylon shuttlecocks have been a popular choice for players of beginner or intermediate levels due to a more durable performance compared to feather ones. 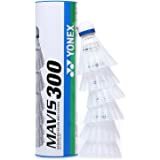 The yonex nylon shuttlecocks offer unparalleled longevity while remaining uncompromising in terms of performance. I received 3 shuttles of poor quality. They would dwindle incessantly while playing. They are good for nothing. I feel cheated. I'm glad I found this review section . I hope people save disappointment by NOT ORDERING this product from here n wasting Money as well as peace of mind. And for more details search for google..
1.0 out of 5 starsGot a counterfeit box from Cloudtail India!! 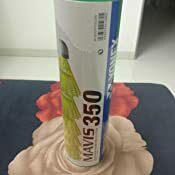 Got a counterfeit box of Mavis 350. The box was of bad quality, logos weren't original or on the correct side. Even the shuttles don't feel the same and the logo inside them was not the real one. The actual logo inside the shuttle has 2 white dots, one on the blue side and one on the green side. This seller had also stuck a barcode sticker over where the actual product code should be on the box. 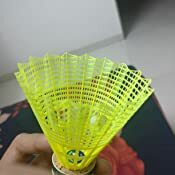 Even the silver yonex stickers for product guarantee which are usually put together were far apart. 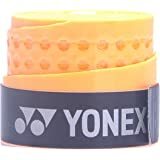 Then the yonex embedded logo on the cap appears on the top and this was on the inside of the box. 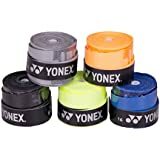 I'm only able to add a single pic, so adding of the wrong yonex logo on the inside of the box's cap. Stay away from buying shuttles from Amazon. 4 out of the 6 shuttles were wobbling straight out of the box and absolutely unplayable. All rejected shuttles are bunched together in the box. I want to give zero stars but since there is no option am giving 1 star! 5.0 out of 5 starsYonex is the best but watch out for fakes ones! Shuttle is ideal for those moving from amateur to intermediate level playing. But this time, I got fake shuttles. from a seller named NooR'sSportsIndustries. The shuttles were made of extremely poor quality plastic by a company called Shuanlian. Extremely hard feathers and they break-off easily and won't last more than 5 minutes of a game. I wouldn't take them even if they are giving it away for free as they don't fly properly either. 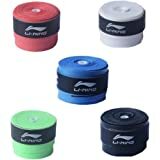 Check the product photos. 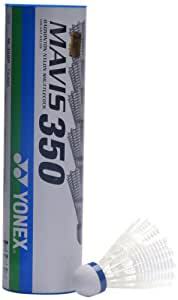 But otherwise, whenever I got Yonex branded shuttles, they were all good and came sealed. I wish those who did not have the right experience or were delivered with fakes ones, they had explained if it was a sealed box with photos and also if they had cross checked the unique code through the website. I got a duplicate product. ( replica). From the Green cap itself we can make out. the Cap is so thin compared to the original one. 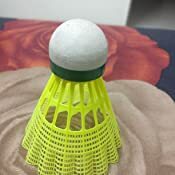 It is like plastic paper, and shuttle did not lost for one single match. This vendors should be banned from selling in amazon. 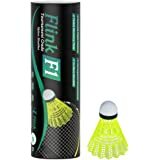 Do not buy this product online. You will regret while playing.